If you haven’t noticed, annual conventions and customer conferences are becoming increasingly popular in the B2B world. In fact, I’ve already attended two myself this year. As marketers, we relish the opportunity to hold customers/prospects captive for a day or more, knowing that we have a good chance of upselling, cross-selling, or at least increasing loyalty. It’s high-stakes, however, as the cost of putting on these events can equate to the GDP of a small country. As such, it’s critical that we make the most of these events. 1. It’s so much cooler than a name badge. You have the opportunity to stand out from your peers and competitors and bring some “wow” factor before they even get to the conference. Imagine the impact of mailing the wristbands to attendees before your event! Now dream about photos of that wristband appearing all over social media with your “Con” hashtag. 2. If your conference includes breakout sessions, a discreet RFID reader at the door registers your attendees without the badge-scanning bottleneck. It also means you can deploy event staff elsewhere, since you won’t need to man every doorway. Bonus: You’ll also know if people walk out early. 3. Real time data allows you to observe traffic patterns to understand where you may need to deploy more staff or divert traffic. This information can also be used while planning future conferences to adjust the layout, modify the event schedule, and add/delete specific activities. 4. With a simple wave of the wristband, customer info can be captured by exhibitors at their respective booths. This is a much less fussy solution than scanning barcodes on a badge, allowing your vendors to interact with more people. 5. You can learn more about a particular customer’s interest by tracking their individual journey through your show. You can also look at attendance patterns to determine which events are valuable to attendees and which should be dropped next year. 6. By understanding aggregate traffic patterns, you can charge a premium to exhibitors for certain spaces or event sponsorships. This becomes a much easier sell when you can quantify the opportunity difference between booth locations. 7. You can reduce costs by optimizing staffing and event space. Can personnel be shifted around based on time of day? When is the most optimal time to schedule breaks? Do you really need all of that floor space? Traffic patterns viewed by time of day can help you answer those questions. 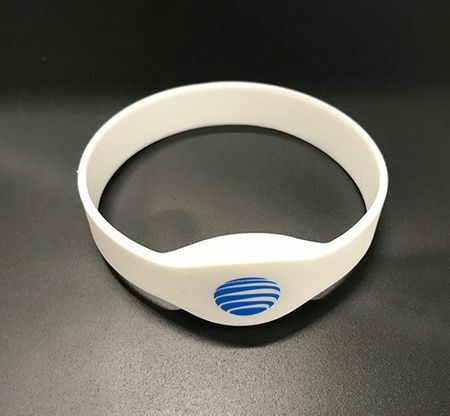 The technology needed to read these RFID wristbands is readily available for rent from a number of companies such as cvent and GAO. After your event, these companies will send you data files, which you can then dissect and interpret to your marketing heart’s desire. And in the meantime, your customers will still be talking about your awesome event!